To begin, it may be useful to review the screen output of a typical TCD device. 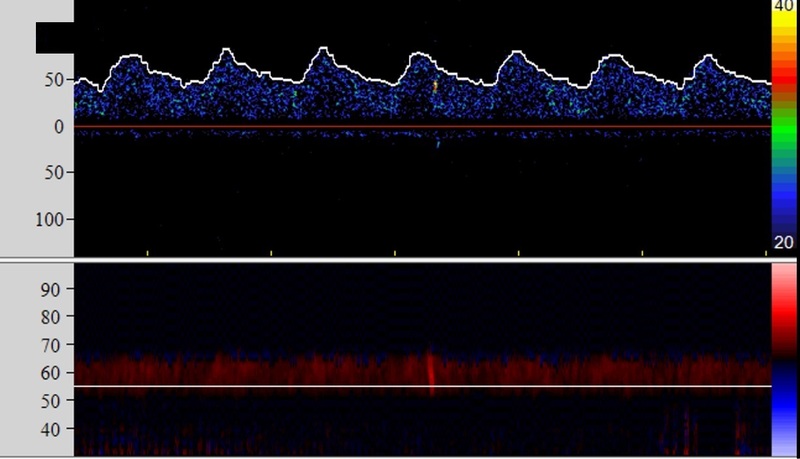 Most modern TCD devices will display two main types of visual information – 1) M-mode, which shows the depths at which a Doppler signal is present, and 2) the spectral plot, or waveform, which displays blood flow velocity at a single particular location. In M-mode, the X axis denotes the function of time and the Y axis refers to the depth at which a signal is insonated. For color flow Doppler, red indicates blood flowing towards the probe and blue blood flowing away from the probe. 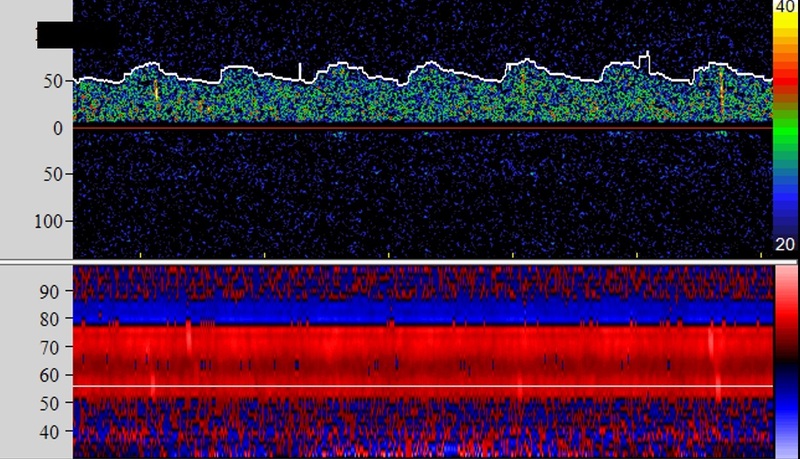 In this case, TCD has found a Doppler signal representative of flowing blood at two different depths (about 45 mm and about 70 mm). At both depths, the blood flows toward the probe, hence it is depicted by the red color. These two areas of signal may be from two completely different vessels (Figure 2-A), or may be from a single vessel which for a while goes out of TCD’s field of view, and then comes back (Figure 2-B). Now imagine the hypothetical vessels shown in the schematic picture of Figure 3. With the TCD probe in position A (assuming the ultrasound beam is not directed at an angle), a vessel with blood flowing toward the probe would be identified. This would be depicted as an area of red in the M-mode (Figure 4-A). If the probe is moved from position A to B, the field of view changes and this time the probe insonates the bifurcation point of the vessel. One branch continues towards the probe, however the other travels away from the probe. So, at this point blood flows both toward and away from the probe. The former causes red signals and the latter blue signals. Hence, in the M-mode you see a vessel in both red and blue colors (Figure 4-B). Later, if you move the probe to position C, you might find two vessels, the shallower one in red and the deeper one in blue, as shown in Figure 4-C. (Note that this is an extreme example for illustration purposes; in reality one would not find such a large gap in distance between the two branches of a single vessel). Similar to M-mode, in the spectral plot X axis denotes the function of time. The Y axis displays blood flow velocity over the specific depth of interest. Blood flowing toward the TCD probe will have a positive velocity, and blood flowing away from the probe will have a negative velocity (this can be toggled back and forth on most TCD machines, however). Typically, therefore, a vessel which appears red in M-mode will have velocity values plotted above the baseline X-axis and a vessel which appears blue will be plotted under the X-axis. In the video following, the examiner is insonating through the temporal widnow and changes the depth of interest from the shallowest levels to the deepest possible levels, passing over at least 4 different vessels. Can you take a guess at which arteries these are? Characteristics of the vessels, such as depth, direction of flow and mean velocity can help you identify specific vessels. Now let’s watch some normal TCD recordings. High intensity transient signals in TCD either reflect gaseous or solid microemboli, or artifact . TCD is a promising tool for detection of microemboli and can be used in clinical practice to guide additional diagnostic and therapeutic decisions . Herein, we want to briefly explain different types of microemboli with special focus on their clinical significance. Cerebral microemboli can be detected in various medical conditions such as atherosclerotic carotid disease [3, 4], cardiovascular diseases [5, 6], and cardiovascular invasive interventions and surgeries [7, 8, 9]. According to their composition, emboli can be divided into two main subtypes i.e. solid and gaseous emboli [10, 11]. Particles of thrombus and atheroma originating from vascular or cardiac sources are examples of solid emboli and generally considered as the main cause of cerebral ischemic events [12, 13]. In contrast, in patients with mechanical prosthetic cardiac valves, gaseous microemboli are more common [14, 15]. Cavitation, which refers to the formation of bubbles from gas dissolved in the blood, is though to be responsible for development of gaseous microemboli [16, 17, 18]. For successful detection of microemboli signals, both spectral waveform and M-mode should be closely examined. When a microembolus passes through the insonated artery, a sharp “chirp” like sound is heard as the ultrasound energy reflects off the embolic material. 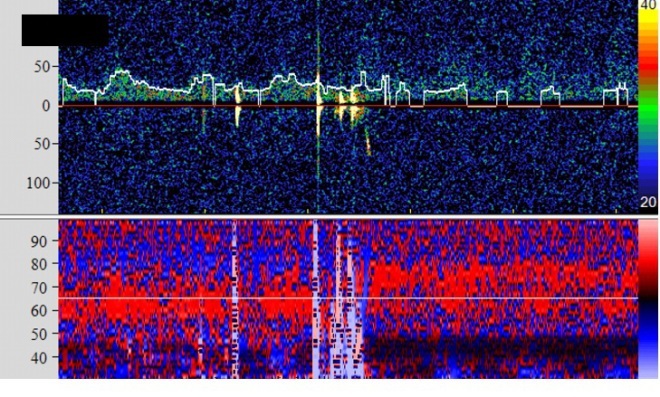 This appears visually as a vertical linear bright signal within the Doppler spectrogram, and is often referred to as a high-intensity transient signal (HITS). When M-mode recording is available, passage of the microemboli from deep to shallow depths (as the emboli moves distally through the vessel) may appear as a linear slightly slanted streak across multiple depths and produces diagonal signal in M-mode. This reflects the movement of the emboli in relation to the Doppler probe over time. (Figures 6 and 7). On the contrary, the artifacts are vertical and so can be differentiated from microemboli (Figure 8). The other issue that can help in the differentiation of microemboli signals from artifacts is that microemboli are limited to the borders of the arteries. Thus, no one expects that the microemboli signals extend to the areas outside the signals of the arteries (Figures 6 and 7). 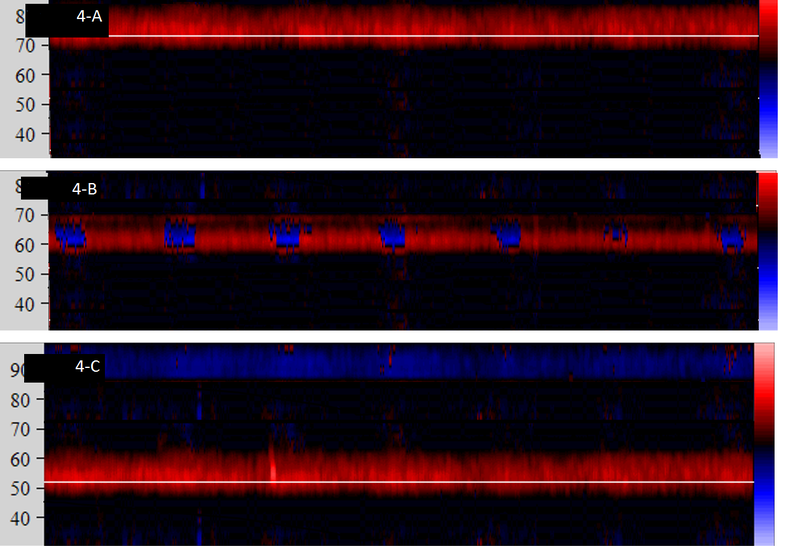 By contrast, in both spectrogram and M-mode the artifacts go beyond the borders of artery (Figure 8). These are two more videos which can help you to become more familiar with microemboli signals.